As device dimensions are shrinking, new technology is needed to create and evaluate structures on the nanoscale. At Newport Corporation, Dr. Tommaso Baldacchini is developing technology for microfabrication and micromachining, creating structures with features on the scale of 100 nm. 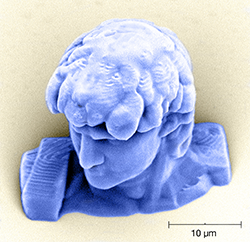 Scanning electron microscopy (SEM) is required to qualify microstructures on the micro and nanoscale. The Phenom SEM is a great time-saver for Dr. Baldacchini, providing SEM imaging and analysis in-house. The choice of the Phenom SEM was based on the scientific merit of the equipment and the knowledge that the technical expertise at Nanoscience Instruments will always be readily available for current and future applications. All photos and images courtesy of Newport Corporation. Newport Corporation is a leading global supplier of advanced technology products and solutions for scientific research. At the Technology and Applications Center in Irvine, California, Dr. Tommaso Baldacchini develops ultrafast photonics solutions for the microfabrication and micromachining R&D market. Traditional machining often employs laser ablation to cut or mill material. Ultrafast microfabrication and micromachining utilize short-pulsed lasers that cleanly create or cut 2D or 3D structures below the micron scale, resulting in detailed microstructures like the ones shown here that was imaged with the Phenom SEM at Newport. The colorized SEM image above is a miniaturized version of Michelangelo’s David and below is a structure within a structure. Partnering with Nanoscience Instruments was also an important factor in choosing the Phenom SEM. Nanoscience Instruments has a team of scientists with technical expertise to support customers with their applications. The company also provides other instruments for materials characterization, like atomic force microscopes, nanoindenters and micromechanical testers, which may be needed on future projects at Newport Corporation. Traditional methods of creating micro or nanodevices often no longer apply as dimensions are shrinking. Newport Corporation has developed a Laser μFAB that uses two-photon polymerization (TPP) to fabricate complicated structures. TPP is a printing technique that allows for true three-dimensional writing of polymeric microstructures with feature sizes as small as 100 nm. Newport Corporation has applied TPP to create devices previously impossible to manufacture with standard manufacturing techniques. Applications include microelectronics, photonics, and biomedical devices for drug delivery. Examples of TPP-created structures are shown above. TPP is the only technique capable of making these kinds of objects at these length scales. An SEM is the best instrument to reveal the surface features of these microstructures. TPP is an additive process where a material is added onto a substrate by means of laser-induced photopolymerization. The Laser μFAB can also perform the subtractive type of processes such as polymer ablation. Examples of removing materials on the nanometer scale are shown below. For this ablated sample, the SEM was used to verify that the ablation lines were distinct and complete, with no debris or raised edges. Ultrashort pulsed lasers were used for this high precision cold ablation with the Laser μFAB. The applications of materials (polymers and dielectrics) ablation are numerous, from photovoltaics to flat panel displays. An SEM provides the depth of field needed to see the top, sides, and bottom of these trenches. 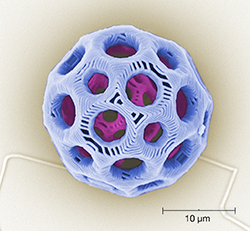 The Phenom SEM is required to image ablated structures on the micro and nanoscale.